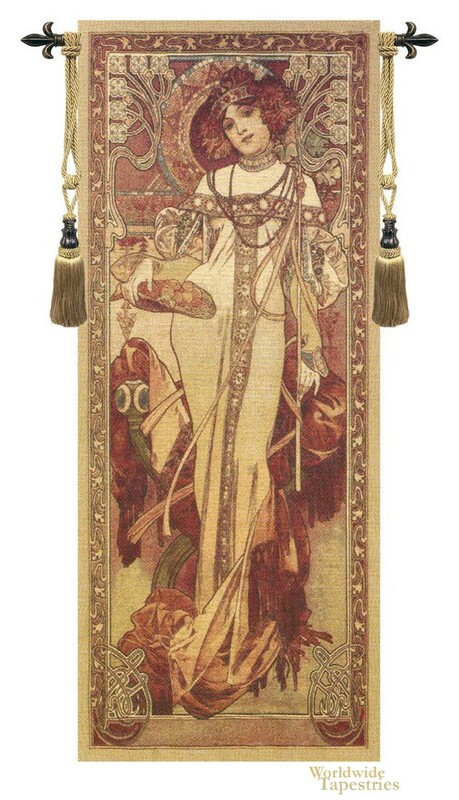 One of a series of tapestries depicting the four seasons, “Art Nouveau-Autumn” celebrates the coming of fall. The subject of the piece, a lovely female, is shown holding fruit and an organic scepter in a style that is the very essence of the Art Nouveau art. The detail is amazing on this tapestry. It is based on the groundbreaking work of artist Alphones Mucha (1860-1939) who helped define the Art Nouveau period, which lasted 30 years. A native of Czechoslovakia, Mucha lived in Paris during the height of his career. There, he painted many works, including Panneaux, a series of works designed around a central theme. These were extremely popular during Mucha’s lifetime. “Art Nouveau-Autumn” is from one of these series. This tapestry is unlined and has a tunnel for easy hanging and display. Note: tapestry rod and tassels, where pictured, are purchased separately. Dimensions: W 28" x H 64"